The most important game in the last round took place in between third ranked New Crusaders (4-2) and eighth ranked Libertad SF (1-7) on Sunday night. New Crusaders were defeated by Libertad SF in a tough game on the road 68-75. It ended at the same time the two-game winning streak of New Crusaders. 24 personal fouls committed by New Crusaders helped opponents get some easy free throw opportunities. The former international forward Paola Naranjo (183-78) orchestrated the victory with a double-double by scoring 18 points and 10 rebounds. Forward Andrea Valdes (179-98) contributed with 16 points and 11 rebounds for the winners. The former international guard Javiera Novion (170-87, college: Eckerd) replied with 24 points, 8 rebounds and 5 assists for New Crusaders. New Crusaders' coach rotated ten players in this game, but that didn't help. Libertad SF left bottom position moving up to seventh place, which they share with Univ.de Los Lagos. New Crusaders at the other side keep the third position with two games lost. Libertad SF is looking forward to face higher ranked Brisas (#5) in the next round and it may be quite challenging game. New Crusaders will play against Sergio Ceppi and are hoping to win this game. An interesting game for Sportiva Ita. (7-0) which played road game in against 4th ranked Boston College (4-3). Top-ranked Sportiva Ita. managed to get a 6-point victory 74-68. Worth to mention a great performance of the former international guard Javiera Morales (178-92) who helped to win the game recording 20 points, 6 rebounds, 7 assists and 4 steals and Narlyn Mosquera who added 11 points and 16 rebounds during the contest. Cuba center Arlenys Gonzalez (185-87) responded with a double-double by scoring 27 points, 14 rebounds and 4 assists (was perfect 7-for-7 from the free throw line). Undefeated Sportiva Ita. have an impressive seven-game winning streak. They maintain first position with 7-0 record. Boston College at the other side keeps the fourth place with three games lost. Sportiva Ita. will play against league's second-placed Univ.de Chile in the next round and it will be for sure the game of the week. Boston College will play against Univ.de Los Lagos and hopes to get back on the winning track. The game in supposed to be also quite interesting. Second ranked Univ.de Chile (7-1) played at the court of 7th ranked Univ.de Los Lagos (1-7). Univ.de Chile smashed Univ.de Los Lagos 92-55 on Sunday. The winners were led by Dominique Del Canto who scored that evening 21 points, 8 assists and 7 steals (on 9-of-11 shooting from the field). Univ.de Chile's coach felt very confident using 10 players which allowed the starters a little rest for the next games. Even a double-double of 17 points and 11 rebounds by Melisa Daniela did not help to save the game for Univ.de Los Lagos. Univ.de Chile have an impressive seven-game winning streak. They maintain second position with 7-1 record having just one point less than leader Sportiva Ita. Univ.de Los Lagos lost third consecutive game. They dropped to the bottom place with seven games lost. They share the position with Libertad SF. Univ.de Chile will meet league's leader Sportiva Ita. in the next round and it will be for sure the game of the week. Univ.de Los Lagos will play against Boston College (#4) and hope to win that game. In the last game of round 8 Sergio Ceppi were beaten by Brisas on the road 79-72. The game between closely ranked teams ended with fifth ranked Brisas' (4-4) home victory over 6th ranked Sergio Ceppi (2-6) 79-72 on Sunday. Brisas forced 19 Sergio Ceppi turnovers. The winners were led by international forward Francisca Rojas (176-93, college: Boston Coll.) who had that evening a double-double by scoring 31 points and 11 rebounds and Nisse Silva supported her with 2 points, 12 rebounds and 6 assists. Brisas' coach used a ten-player rotation which allowed the starters a little rest for the next games. Even 21 points and 6 rebounds by Camila Padilla (-95) did not help to save the game for Sergio Ceppi. The former international Claudia Galaz (-88) added 11 points and 5 rebounds for the guests. Four Sergio Ceppi players scored in double figures. Brisas maintains fifth position with 4-4 record. Sergio Ceppi lost fourth consecutive game. They keep the sixth place with six games lost. Brisas will meet Libertad SF (#7) in the next round. Sergio Ceppi will play against New Crusaders and hope to secure a win. The game in supposed to be also quite interesting. Second ranked Univ.de Chile (7-1) played at the court of 7th ranked Univ.de Los Lagos (1-7). Univ.de Chile smashed Univ.de Los Lagos 92-55 on Sunday. Univ.de Chile dominated down low during the game scoring 68 of its points in the paint compared to Univ.de Los Lagos' 40. Univ.de Chile forced 26 Univ.de Los Lagos turnovers. They looked well-organized offensively handing out 24 assists comparing to just 10 passes made by Univ.de Los Lagos' players. The winners were led by Dominique Del Canto who scored that evening 21 points, 8 assists and 7 steals (on 9-of-11 shooting from the field) and the former international guard Francisca Salvatierra (173-94) supported her with 23 points and 4 assists (on 10-of-12 shooting from the field). Univ.de Chile's coach felt very confident using 10 players which allowed the starters a little rest for the next games. Even a double-double of 17 points and 11 rebounds by Melisa Daniela did not help to save the game for Univ.de Los Lagos. Constanza Maldonado added 16 points and 9 rebounds for the hosts. Univ.de Chile have an impressive seven-game winning streak. They maintain second position with 7-1 record having just one point less than leader Sportiva Ita. Univ.de Los Lagos lost third consecutive game. They dropped to the bottom place with seven games lost. They share the position with Libertad SF. Univ.de Chile will meet league's leader Sportiva Ita. in the next round and it will be for sure the game of the week. Univ.de Los Lagos will play against Boston College (#4) and hope to win that game. An interesting game for Sportiva Ita. (7-0) which played road game in against 4th ranked Boston College (4-3). Top-ranked Sportiva Ita. managed to get a 6-point victory 74-68. Worth to mention a great performance of the former international guard Javiera Morales (178-92) who helped to win the game recording 20 points, 6 rebounds, 7 assists and 4 steals and Narlyn Mosquera who added 11 points and 16 rebounds during the contest. Cuba center Arlenys Gonzalez (185-87) responded with a double-double by scoring 27 points, 14 rebounds and 4 assists (was perfect 7-for-7 from the free throw line) and the former international forward Jenifer Fuentes (178-96) scored 12 points. Sportiva Ita. have an impressive seven-game winning streak. They maintain first position with 7-0 record. Boston College at the other side keeps the fourth place with three games lost. Sportiva Ita. will play against league's second-placed Univ.de Chile in the next round and it will be for sure the game of the week. Boston College will play against Univ.de Los Lagos and hopes to get back on the winning track. The most important game in the last round took place in between third ranked New Crusaders (4-2) and eighth ranked Libertad SF (1-7) on Sunday night. New Crusaders were defeated by Libertad SF in a tough game on the road 68-75. It ended at the same time the two-game winning streak of New Crusaders. 24 personal fouls committed by New Crusaders helped opponents get some easy free throw opportunities. The former international forward Paola Naranjo (183-78) orchestrated the victory with a double-double by scoring 18 points and 10 rebounds. 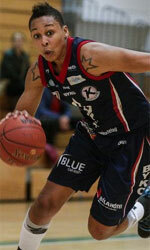 Forward Andrea Valdes (179-98) contributed with a double-double by scoring 16 points and 11 rebounds for the winners. Four Libertad SF players scored in double figures. The former international guard Javiera Novion (170-87, college: Eckerd) replied with 24 points, 8 rebounds and 5 assists and Ada Bernal added 15 points and 8 rebounds in the effort for New Crusaders. New Crusaders' coach rotated ten players in this game, but that didn't help. Libertad SF left bottom position moving up to seventh place, which they share with Univ.de Los Lagos. New Crusaders at the other side keep the third position with two games lost. Libertad SF is looking forward to face higher ranked Brisas (#5) in the next round and it may be quite challenging game. New Crusaders will play against Sergio Ceppi and are hoping to win this game.